The Santa Monica Criminal Investigations Support Section is overseen by a Public Services Administrator who is responsible for overseeing four units in the areas of Records, Property, Crime Analysis, and Court Services. Together, these units support the Department with management of information systems, coordinate records retention and dissemination concerning crimes and arrests, manage seized property, provide legal court documents to government agencies, and analyze crime statistics to identify crime trends. 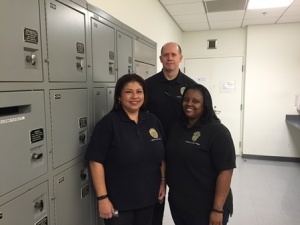 The Records Unit is dedicated to maintaining and ensuring the integrity of data generated by the Santa Monica Police Department. It is staffed 24-hours, seven-days a week and supported by three (3) Supervisors, fifteen (15) Records Technicians and two (2) Police Cadets. The Records Unit is responsible for processing reports including criminal, traffic, and arrest reports. Over 16,000 reports are processed yearly including 26,000 citations for traffic, infraction, and misdemeanor violations. Laws governing the storage and release of impounded vehicles are also reviewed. At least 2,500 impound releases were reviewed last year. In addition, public requests in adherence to laws governing the California Public Records Act are processed and reviewed by our staff. This unit is also responsible for managing the statewide database known as the California Law Enforcement Telecommunications System (CLETS). They monitor, enter, and update information for stolen vehicles, missing persons, registrant information, serialized stolen property, restraining orders and their violation. Criminal history and wants/warrants checks for custody paperwork forwarded to the court are also administered by this unit. The Property Unit is entrusted to receive, document, and safeguard all property and evidence submitted to the Santa Monica Police Department's custody. It is staffed by a unit Supervisor, three (3) Property Technicians and two (2) Police Cadets. Over 10,000 items are received each year. There are three types of property received: found, safekeeping, and evidence. Found and safekeeping items are kept for a period of 6 months, while any evidence property is kept until no longer deemed necessary to a respective case. Unclaimed items are subject to removal by this unit. Any unclaimed items of value in fair to good condition are auctioned through a public auction company. Our Department uses Property Room as an auction house. For more information, please visit their website. The mission of the Crime Analysis Unit (CAU) is to collect, analyze, and provide timely and accurate tactical, strategic, administrative, and operational analysis and intelligence products. The CAU exemplifies the Santa Monica Police Department's mission, vision, and values in their goal of suppressing criminal activity, aiding the investigative process, and increasing the apprehension of offenders. The duties of the Court Services Unit are to accept subpoenas, summons, and other legal documents on behalf of the Police Department. They work closely with the City Attorney's office in civil litigation cases; gather dispositions on criminal cases in trial and track cancellations and continuances. They assist attorneys, witnesses, employees and other agencies with routine questions involving the court process and their case. The Unit is also responsible for monitoring subpoenas for officers and other police department personnel and accepts fees for such when necessary.